2014 is the year I get something done. It’s the year I get serious about writing this novel that has been in my head for so long. But how? I hear you all ask me. You work long hours, have two children under 4 and a wife… That’s impossible! Normally I would agree with you 100% – but I have a plan. I’m not kidding myself I doubt I will finish said novel in 2014, just get serious about! To that end I have some tools to help me along. Before I get into those tools and the methods I will try to use, here is something inspiring that makes me happy and makes me feel like I can actually do this. I need to post this here so that when I get down (and I will) I can look on this and think that I really can make it. I still have time. I am also using Evernote to note down ideas or thoughts as they come to me – I use the iPhone app which is great as my phone is always with me – so I can easily jot something down and have it there on my PC when I get home. I can also add images which is also great for idea generation – if I see something I like something that could be described or used in the story I can take some pictures or link to a website and there my idea is saved for me to use later. I also use Pinterest to capture images and ideas I find that having a heap of different images around a theme helps me to describe that in my novel. The Metropolis in this story is vast and has many layers and levels, it is more than any physical city we have today and yet I am finding small bite sized chunks of my city in the world. So I have been collecting them on a Pin board – one I can look at easily and grab a few simple snapshots from to help describe a scene or a moment in the story. I will also use this idea for many other aspects of the story as it develops. I liken this to research. You can see my Pin board here if you want to see what I have so far. 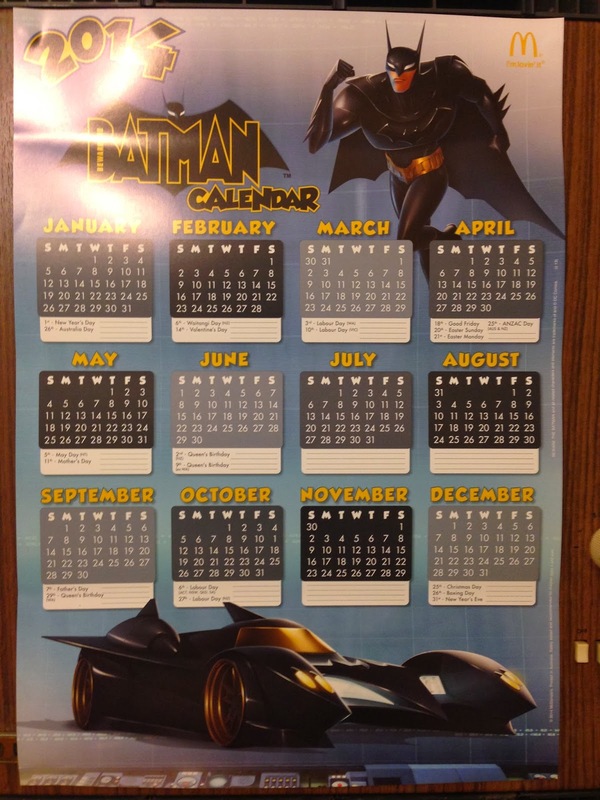 I have my own small version of his calendar courteous of McDonalds Ringwood… it’s BATMAN! Each day I do something on my novel I get to mark it off. It might be research, character development or actually banging away at the keyboard, this is the trick to getting it all to work this year. To actually do something on it each day. 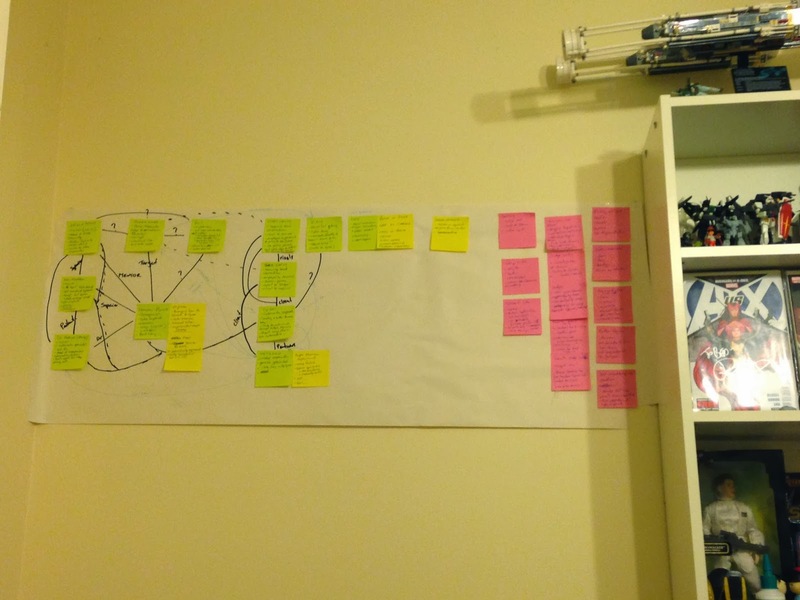 Process Mapping. It sounds a little managerial speak (and truth be told that’s where I got it from) but for me this technique allows me to ‘see’ the connections between characters, places, events and mark out the plots and movements. It’s nothing new or ground breaking it does however give me something to work from and on. Panel of Experts will be people I can call on to read through parts of the story, give me feedback and comments on the characters, ideas, grammar and spelling!!! My beautiful wife is a teacher and librarian, we know others similar and my good friend Zles has a degree in creative writing and is hopefully embarking on his writing journey as well this year. So I hope to be able to get these friends to help me find my voice and make sure it is creating what I want. A tale people will want to read and experience. Books, books and more books. I also need to read this year – to get a better understanding of what makes a good story better, what works and what doesn’t (at least for me). I have heard a lot from writers saying they went out to write a story they would read. There is a lot to be said about that. The writers I like have written a number of books and get a hell of a lot of readers, so my tastes can’t be that bad. If I can write something that I like then chances are there will be others that like it as well. There are other tools I will be using, my headphones (at times), music, dedication and support, maybe even this blog will be a tool I can use to test chapters or scenes with you all. However, mostly I will need confidence that I can do this and that I will achieve what I want. I was looking for a brilliant article that I read sometime last year to link you to. The problem is that I cannot remember what author wrote it and i have had no success, so I will try and give you the basic concept. The article was written for a person in exactly your situation. In it the author was suggesting taking the route of using amazon kindle self publishing. Like many authors he felt that authors all fell on a spectrum between those that totally planned everything out in advance and those that went on a journey of discovery, Personally he liked both. He talked about how he would always basically plan out an entire novel, including all of its' characters, and then he would write a short story or stories for each of the main characters and use that experience to discover what the character was really about. These stories did not need to be large or complex, often his were only a few pages long. He suggested that this may be a good route for first timers to try and gave a number of reasons. 1. Writing a novel (or even a novella) is daunting. A short story requires equal amounts of craft but is a lot less work. 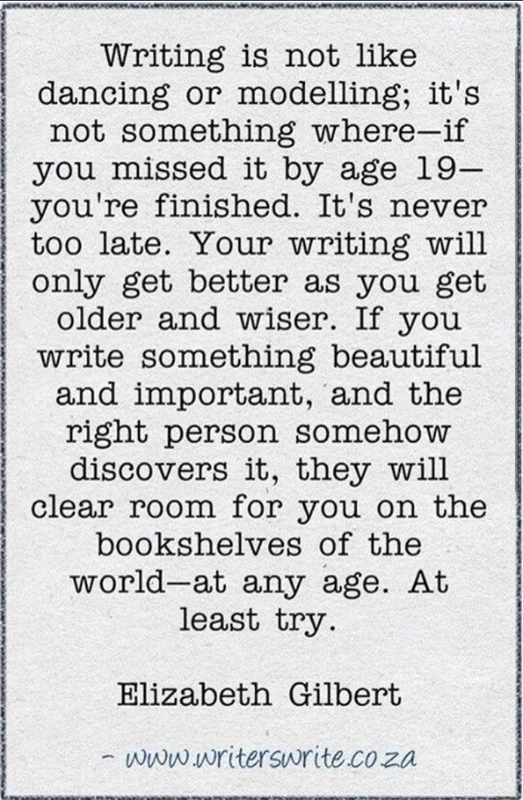 You can also accomplish something sooner which can help inspire you to keep going with the novel. 2. The author claimed that many writers who have the all-encompassing plan for the novel often find it harder to write than those that don't. He felt that often it actually restricted character development and that by writing short stories about a character in advance, it allowed you to better understand your characters and thus was actually part of the planning process. 3. These short stories give the opportunity for feedback from friends, family and colleagues. Also if you get enough of them, you can self publish on amazon (for free) and try and use it to create interest in the novel. He was also of the opinion that first timers should consider the option of multiple novellas as opposed to a single large honking novel. He felt that in the age of self publishing getting something out in a more regular fashion (looking at you here Mr G.R.R. Martin)was the more likely way to build a fan base. Unfortunately he finished the article be pointing out that just like traditional publishing, self-publishing needs a great deal of hard work and luck to be a success (talent varies and often appears not to be a factor). The only difference is that you do not need to go through a thousand or more rejections before your work may become validated by becoming public. As you can see the article really stuck in my head. I hope that I have remembered it correctly. I just wish that I could remember the author. The calendar is a good way to track things, but more than that, I like that you aren't locking yourself into “writing x words a day”. That could be tough, and it's also intimidating to have that hanging over your head. The great lesson I've only recently understood is that writing doesn't mean writing x number of words a day, chapter by chapter. It might be all good and well if you are in a hot streak (and by all means ride that! ), but if you are struggling, that kind of pressure is a straight jacket. Writing is like a river – if you find yourself blocked, you can flow another way. * Plot development through question and answer session. There's a variety of tasks you can do that keep moving things forward. Mark a cross each day and make yourself accountable by blogging every 2 weeks on progress you have made! You said yourself, you don't need to complete a novel in 2014. Just keep moving forward and you'll get there one day. Thanks David that is some good advice. I will try to create some short stories or parts of the whole to get the world set in my mind. Then I can go back and insert or use them when creating the larger story. Even use the blog to get them out for open comment etc. That is exactly my plan – I'm not going to be able to go from couch potato to marathon running in no time. I need to build up and the ground work is just as (maybe more) important than the word count. I hope you get to reach your goals this year as well.